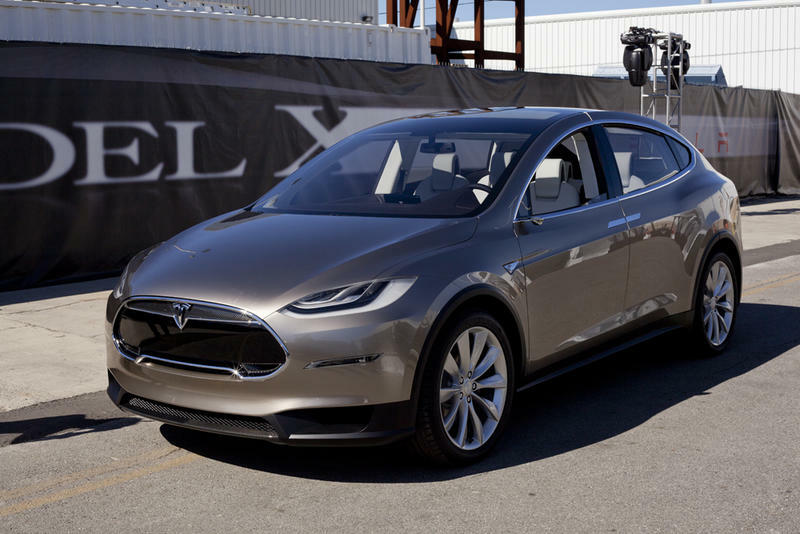 Tesla Unveils Model X Electric Crossover ... SUV? Minivan? Tesla CEO Elon Musk took to the stage at his company’s design studio outside of Los Angeles Thursday night to unveil the Model X electric vehicle. Built on the same platform as the Model S sedan, the X is a seven passenger SUV/CUV/Minivan described as quicker than a Porsche 911, roomier than an Audi Q7, and better looking than any minivan ever driven by a Soccer Dad or Hockey Mom. Thanks to skateboard (under the floorboards) placement of the batteries, the X has seating for seven and room for their luggage split between front and rear trunks. 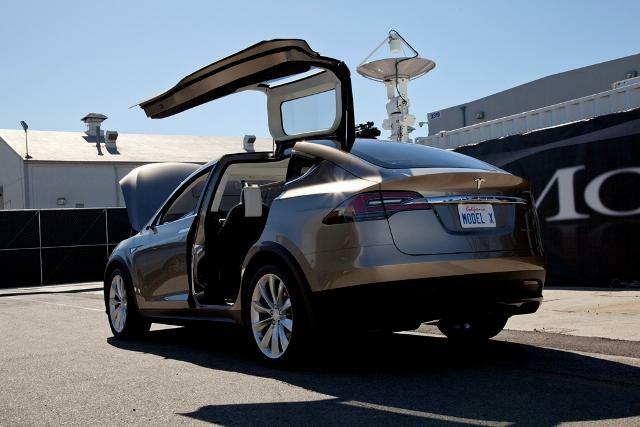 The car is slated to reach its first customers in late 2013, and pre-order reservations were made available to event attendees immediately after the Model X was unveiled. Pricing is expected to be “similar” to that of the Model S, which starts at $57,400 before tax credits. Musk said the X can accelerate from 0-60 mph in just 4.4 seconds; that figure apparently applies to the peformance variant also slated for production. Still: An electric SUV that sprints to 60 in under 4.5 seconds? Whoa. The car will also feature dual motor all wheel drive, with one electric motor providing power to each of the front and rear axles. 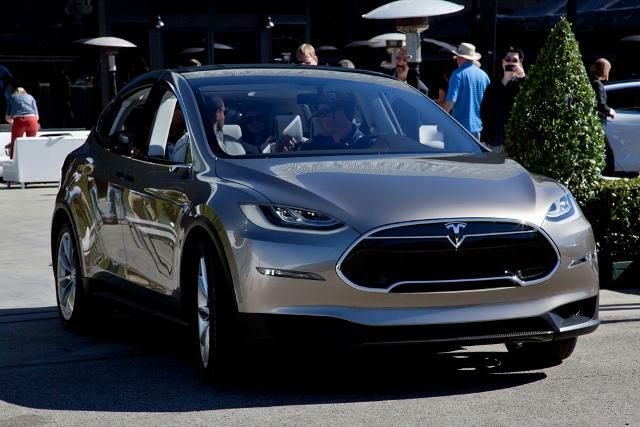 Range will be approximately 10% less than Model S counterparts, owing mainly to the X’s extra weight. Styled along similarly swoopy lines as the Model S, the X is slightly elongated as compared to the five seater sedan, and features attention-grabbing “falcon doors.” A 21st Century take on the wood paneled sliding doors of minivans past, X’s hinged wings open a little bit out and a whole lot up, providing for easy access to the seating area in even the tightest of quarters. Musk showed a photo of a Model S and X side by side in a garage to illustrate the easy access to the X’s second and third row seats. The father of five (triples and twins!) also highlighted the ease with which parents can buckle their kids in and out of child seats. 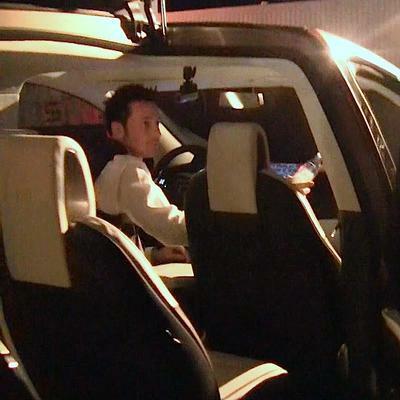 No doubt Model X is roomy, though Musk struggled a bit when demonstrating how “easy” it is to slip in and out of the rearmost row – as did I when I later got a ride in the same prototype (see video). Production vehicles will feature second row seats that slide fore and aft to aid in third row ingress/egress, according to Tesla. The X will also feature an interior quite similar to the S’s. From the massive 17″ touchscreen in the center stack to the leather seats and premium materials, Tesla’s interior design team did right by their sedan and rightfully felt no need to mess with success when it came to their crossover. When I sat in the vehicle I noticed the rear seats were rather short, and if not for the scooped out “skylight” areas of the falcon doors I wouldn’t have had adequate headroom. 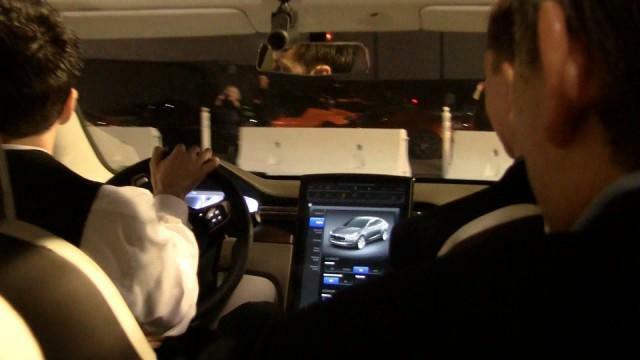 But again, this was just a prototype and Tesla is all about the Silicon Valley method of iterative design. All in all, the prototype – Did I mention it was just a prototype? 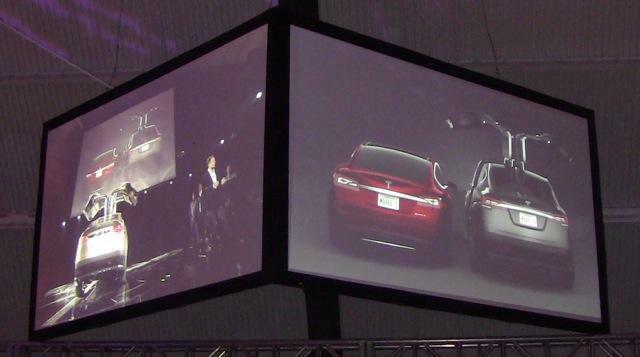 – Model X shown off tonight was impressive and buzzworthy. A very short test ride impressed when it came to acceleration, handling, and overall ride quality, though my seat in the back row felt a wee bit snug. X’s seating for seven configuration might best be suited to, say, five adult-sized and two child-sized passengers as opposed to seven fully grown tech bloggers. Then again, the weird headrests and overall configuration of the bucket seats may well change before production begins. Tesla’s first car, the Roadster, is a high performance thrill ride. Their second car, the Model S sedan, cut the Roadster’s base price nearly in half while delivering state-of-the-art battery technology and Maserati-esque stying. Well, not “delivering” quite yet – the first S will reach Customer #1 later this year. If the X can live up to the promise made by its launch tonight, Tesla could be on the verge of bringing bleeding edge electric powertrain tech and head-turning styling to the hot crossover market. If only Musk & Co. could come up with a plan for a lower cost electric vehicle for the masses who can’t afford a $60,000 car. Oh wait, apparently they already have … the Tesla for the masses is said to be next on the upstart car maker’s agenda. Sadly, the world will have to wait another two years for that car’s unveiling.